Qlik Sense 1.1 Has Arrived! 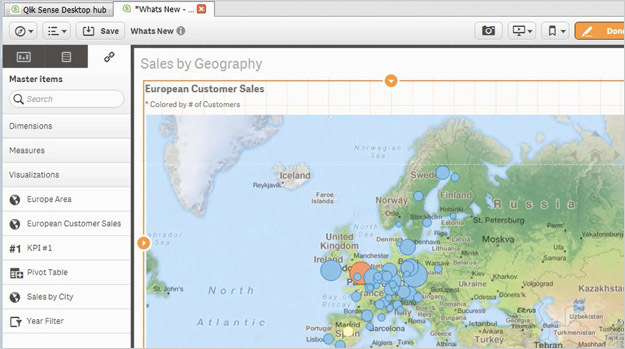 Qlik is upping the ante, let us show you what’s new! We are delighted to announce the release of Qlik® Sense 1.1, the first of 3 Qlik Sense releases we will deliver this year. Qlik Sense 1.1 is proof of our commitment to make analytics dramatically simple, yet powerful, by providing ongoing innovations in visual analytics. More flexible analysis with our *New* Pivot Table – You asked for it, you got it. Not just any pivot table, but one that meets the standard of Qlik usability and leverages the power of our unique associative engine. This new visualization object allows users to easily arrange, rearrange, and filter information in a cross tabular format. It instantly recalculates metrics and subtotals on large data sets, and allows for associative selections and search directly on dimensions in the table. #QlikSense 1.1 is here! Learn more about what we've added & be the first on your block to download it! More clear dashboards with our *New* KPI Object – Sometimes we just need immediate clarity and the ability to jump into the data when something isn’t right. The new dedicated KPI visualization object allows two metrics to be clearly highlighted, viewed and compared. It provides a direct link to another sheet allowing the user to ‘drill in’ to detail, and automatically displays colors, gradients, and graphics based on conditions. Making it even more straightforward to see not only what, but where with our *New* Mapping Enhancements – We now deliver an out of the box tile server, with improved control over styles and formats, and the ability to use maps in our collaborative data stories. The out of the box server is offered through an OEM agreement with MapBox for their OpenStreet product, which automatically displays backgrounds on geographic maps for easy creation and allows for unlimited commercial use by our customers. In addition to the above there are many usability improvements, all designed to make your experience with Qlik Sense as naturally intuitive, valuable and satisfying as humanly possible! Coming four months after we first released Qlik Sense to the market, Qlik Sense 1.1 is the most recent example of how we plan to provide to the market regular, cadenced releases, each with exciting new capabilities, feature enhancements and on-going maintenance of existing capabilities. To learn even more, visit the Qlik Community for a full library of how-to videos including this getting started tutorial. Want to see and try it yourself? Download the brand new full-featured version of Qlik Sense 1.1 desktop for FREE and watch our how-to videos to learn how to use all the new features!